An early fog had mostly burned off by the time the first race got underway, but if you were at Muscoot early you got treated to an early morning light and color show courtesy of the sunrise and the peak fall foliage. The dry conditions in the weeks heading up to the race combined with the late fall leaf drop made for better than normal footing for runners. After holding for 2016, a bunch of course records fell in 2017 — mostly to some phenomenal young runners who have had some prior race experience on the trails of Muscoot. More details below. The overall 5 miler race records stood this past Sunday. Gerry Sullivan’s 2010 dominant performance is still the gold standard for Run The Farm 5 milers to strive towards. Kerri Lyons‘ 2014 performance still stands the test of time. More details below on the 2017 Five mile race. 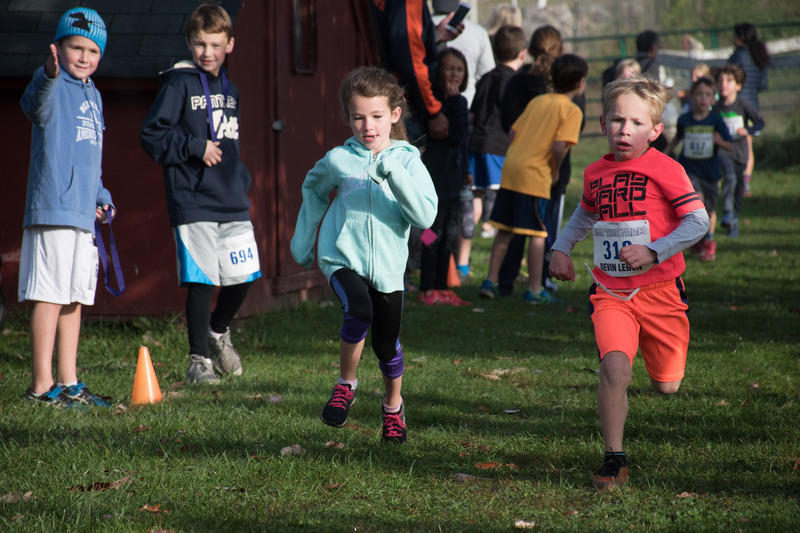 Over 750 runners crossed the finish line between the three races.The combined kids races had just over 300 finishers for the day. The warm and sunny forecast caused a mini last-minute registration rush during the final days of registration. Same day registration was around normal levels, mostly for the 5 miler. A few early rising kids got the last few remaining spots for Kids Run The Farm. We want to thank our gracious hosts at Muscoot Farm, especially Brenda, Jonathan, Brad, Joan, and everyone who helped out at the farm to get it ready for our Eighth annual event. 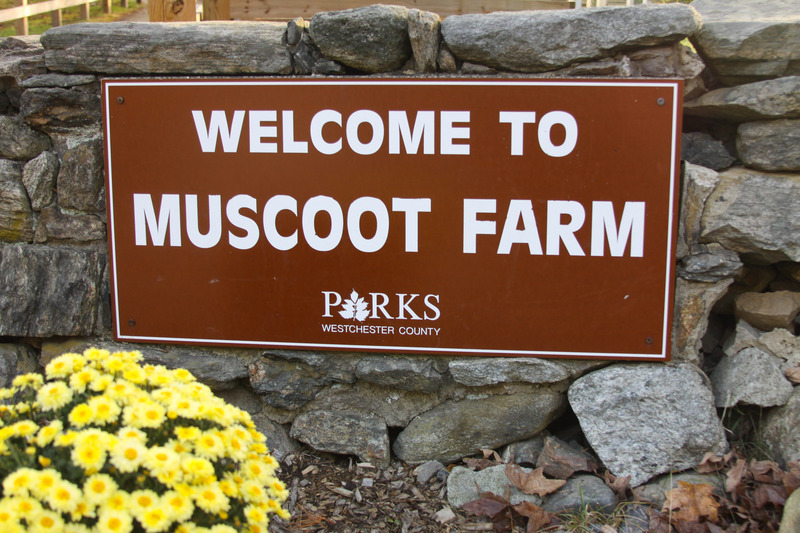 Muscoot Farm is one of the beauties of the Westchester County Parks system. The authentic 1890s-era historical working farm has enriched the lives and education of generations of kids and kids at heart. Who can resist gobbling along with the turkeys, clucking with the chickens, and quacking with the ducks? How many times have you passed the cows and not said “MOOOOOOO!” (never?). Did you know that goat’s eyes have rectangular pupils? You do now, thanks to Muscoot Farm! 2017 Registration crew (early shift). 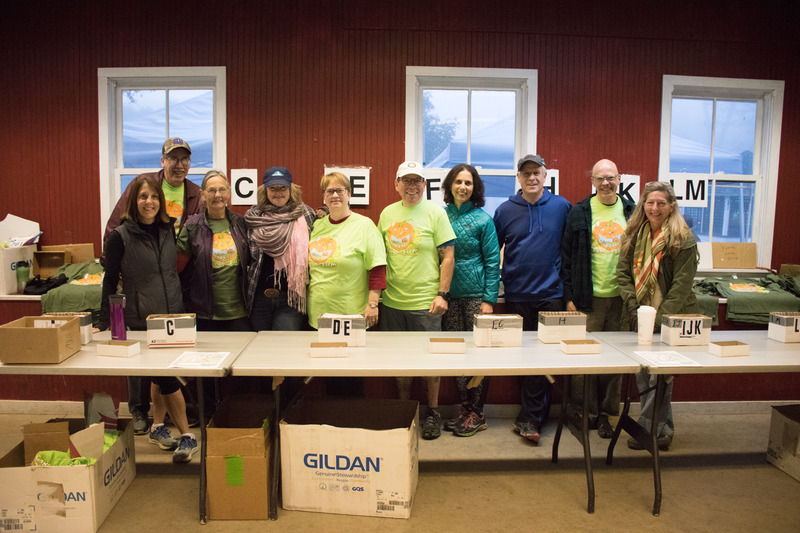 Thank you to all of the race volunteers who come out and help with the registration, setup, timing, handing out farm bucks and medals, distributing bagels, patching up injuries, making sure runners turn onto the correct trail, setting the course, sweeping the course, and cleaning up so other park visitors enjoy the same experience we all had. We also had a team of volunteer photographers (Michael, Tom, Diane, Dave, Alan, Carol, John, Ciorsdan, and Rob) out there who took photos of you all (and your kids) on Sunday morning! An outline (in progress) with links to all of their photos is here. Didier Morelli on the homestretch at Run The Farm 2017 (photo by Diane Bradsell). 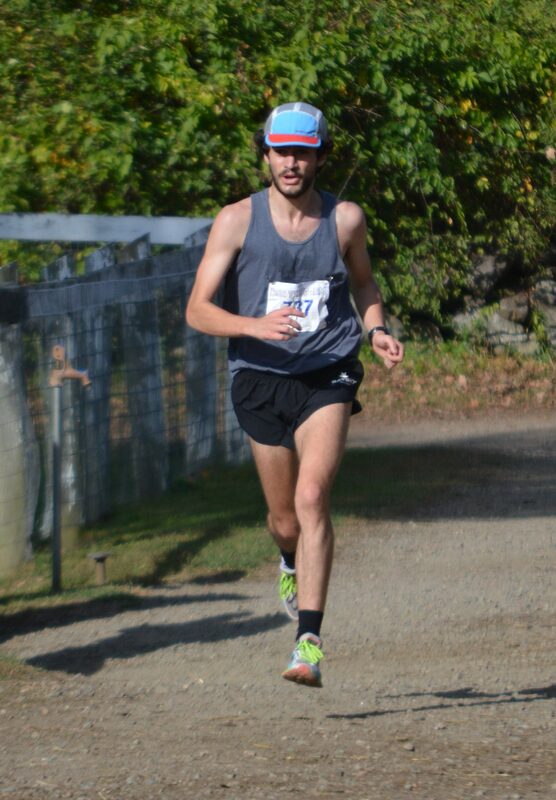 Didier Morelli (31:47) of Ridgewood, NY finished first by thirty seconds ahead of second place finisher Luis Francisco (32:17) of Mahopac, NY. Third overall went to Benjamin Hopkins (33:53) of Larchmont, NY. Virgil Bretz (34:01) of Mt. Kisco, NY and John McElroy (34:34) of Danbury, CT rounded out the top 5. Lindsey Felling of Larchmont, NY won the women’s division in 38:01. Kirby Mosenthal (38:05) of Briarcliff Manor, NY finished a very close second. Past winner Ann MacDonald (38:24) of Mt. Kisco NY finished third. Kelsey Crawford (39:10) of Katonah, NY finished fourth, and Mary Kauffman (39:37) of Williamstown, MA was fifth for this year. We had over 300 runners between the two kids races this year. This was definitely a record turnout for the 12 & under crowd! Thanks to everyone for coming out! From the first runner to the last — the race is all about you! Morgan Eigel winning the 2017 kids 7-12 year old race (photo by Rob Cummings). Morgan Eigel now has a four-peat — extending her winning streak into her final year of kids race eligibility at 12 years old. To top that off, she won the 7-12 year old race, breaking her own course record and setting a new girls course record at 6:43. We’ll say it once again: Morgan bears watching in the cross country field. We can’t wait to see her on her cross country team — and hopefully at the 2018 Run The Farm 5 miler next year! 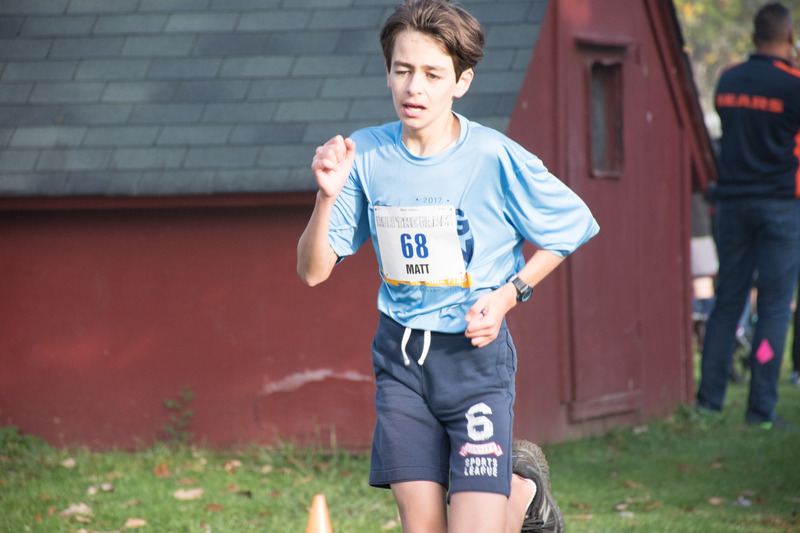 Matt Califano winning the 2017 boys 7-12 year old race (photo by Rob Cummings). Matt Califano (6:46) was just behind Morgan in the home stretch. He also set a new course record for 11 year old boys, breaking Eamonn Sullivan’s 4 year hold on the 11 year old spot. Owen Farrell wins the 2017 6 years & under kids race (photo by Ciorsdan Conran). Owen Farrell (4:57) won the overall boys 6 & under race. Cadence McGuire (5:26) won the overall girls 6 & under race. Cadence McGuire wins the 2017 girls 6 years old and under race (photo by Ciorsdan Conran)..
Records were made to be broken — this year FIVE of the twenty two age group kids course records fell. Our oldest kids course record has stood since 2010, held by then 9-year old Allison Arcidiacono of Katonah. 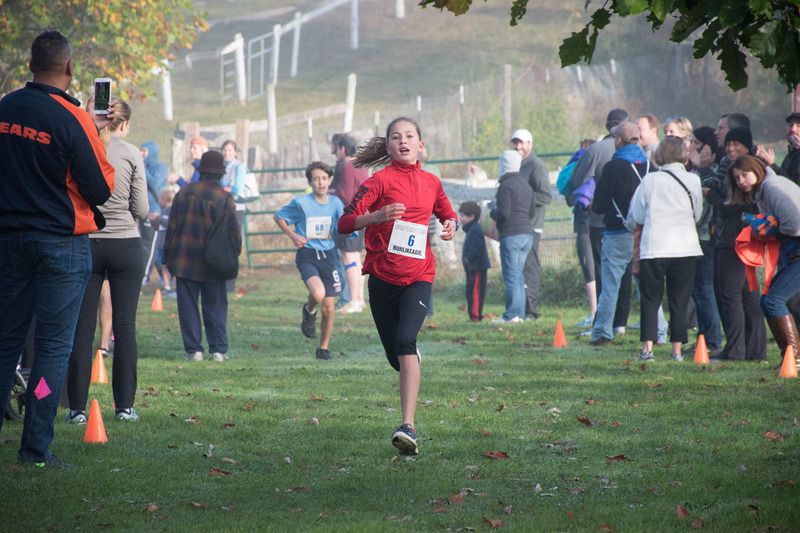 Her record was taken over this year by currently 9-year old Katonah resident, Abigail Nager with a time of 7:42. Emily Cullen (7:57) of Ossining took over the 3 year old girls record. Four year old Ayla Goore (6:26) of East Orange, NJ got the 4 year old girls course record. Morgan Eigel (6:43) took over the 12 year old girls record with her overall win. Matt Califano (6:46) took over the boys 11 year old course record with his win. A final note about age-group records. They are quite an achievement for these young runners. 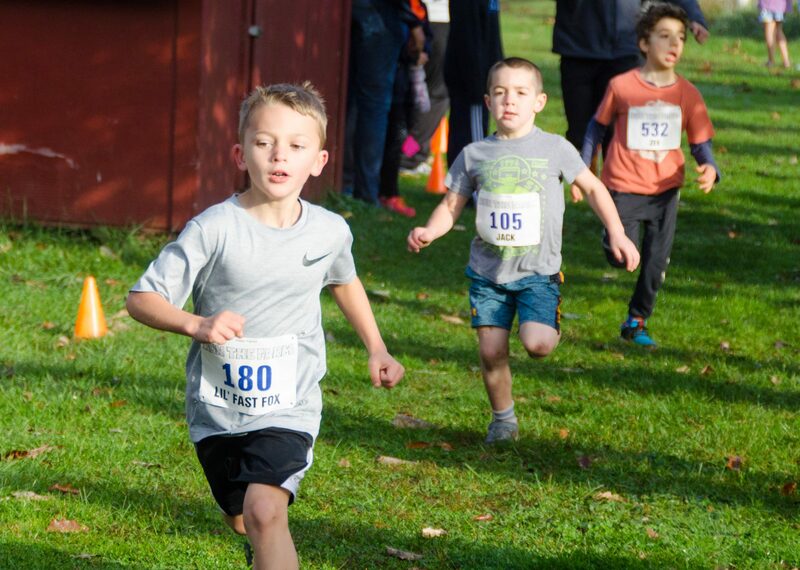 They are not only competing with the kids in that day’s race, but also every kid who ran in the 7 years prior Kids Run The Farm races. Every year it gets a little bit harder to break one of the course records — and five of them fell this year! The Leathermen band performing post race in 2017 (photo by Ciorsdan Conran). 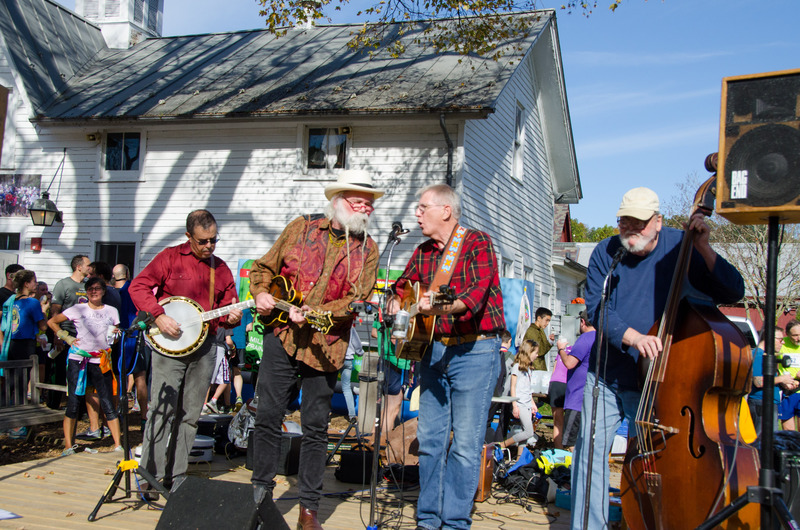 For post-race entertainment we welcomed back The Leathermen bluegrass band. John and the group have been long time guests of both the Leatherman’s Loop and Run The Farm. They always draw an appreciative crowd. The 2017 Trail Mix Trail Series has over 200 runners who are eligible to complete the series continuing from Leatherman’s Loop (April), A Mild Sprain (May), Where The Pavement Ends (Sept) and the Sarah Bishop Bushwhack (Sept). Trail Mix Results to date can be found here. These will be updated shortly with Run The Farm results once final results are certified. One thing we can tell you for sure about the Trail Mix: If Luis Francisco wins Raven Rocks Run, he will guarantee his spot on the Trail Mix Series Trophy. The same holds true for Kirby Mosenthal – a win at Raven Rocks guarantees the Trail Mix Trophy spot. Both Kirby and Luis received the first-ever Trail Mix Series “Yellow Jerseys” a la the Tour de France as the current overall series leaders. 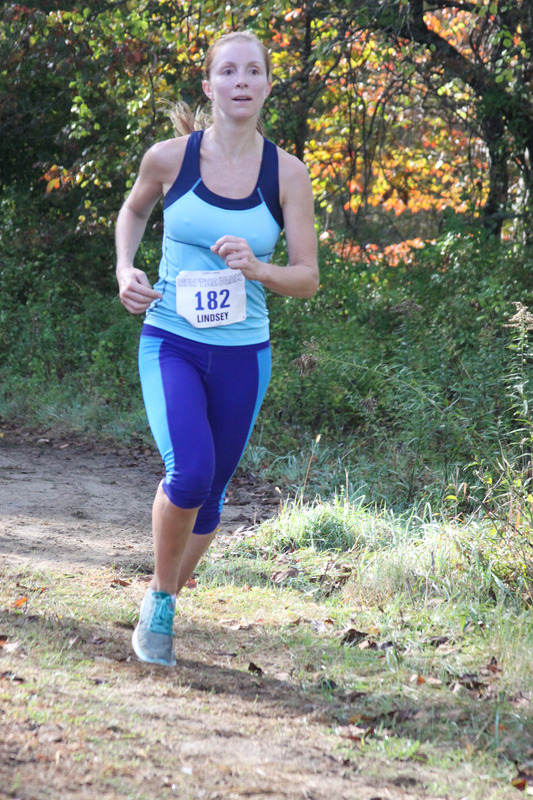 The FINAL race in the 2017 Trail Mix Series is the Raven Rocks Run on November 12th, 2017 at 9am at Ward Pound Ridge Reservation. The course starts and ends in the same spot as the Leatherman’s Loop, but heads into the high hills of the Rez. Sign up now for this challenging capstone for the 2017 Trail Mix Series. When we redeemed the farm bucks for real $ at the end of the day the Run The Farm “Farm Bucks Top 5” Champs of 2017 were 1.) Dutch Desserts, 2.) Bear Mountain Coffee Roasters, 3.) Meredith’s Bread, 4. ), Pickle Licious, and 5.) Healthway Farms. The vendors loved having the runners there — and loved the energy on Sunday! The Muscoot farmer’s market continues through November 26, 2017. After then, most of the vendors move to indoor farmer’s markets. Then they will return to Muscoot in May 2018. Somers VFD EMS crew on standby at Run The Farm 2017. An extra special thank you goes out to the Somers VFD EMS crew for coming out and supporting the race and runners. 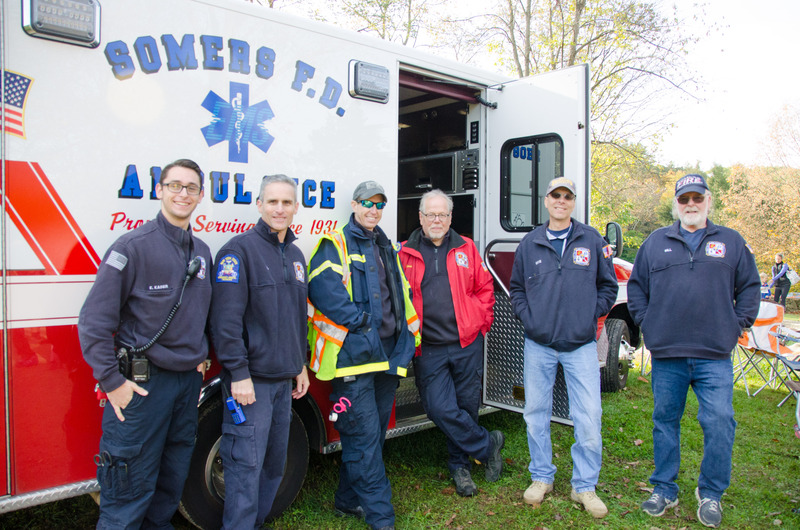 The Somers EMS crew has been with for all 8 years of Run The Farm. They are always helping and assisting all comers. Sunday saw a few scrapes & bruises — we don’t know the extent of any injuries due to privacy rules, but we always send good healing vibes out to them! Lastly we want to thank the runners and families who came out to participate in this tradition. We are blessed to be able to celebrate such a great event with all of you. Next up: Raven Rocks Run on Sunday November 12th, 2017 – the 6th and final race in the Trail Mix Trail Series 2017! Sign up now! Custom bib orders are going in 15 days before the race!